After months of leaks and rumors, Sony has finally officially announced the PS3 Slim for release on September 11 for $299, which also happens to be the new price point for most existing PS3 models. 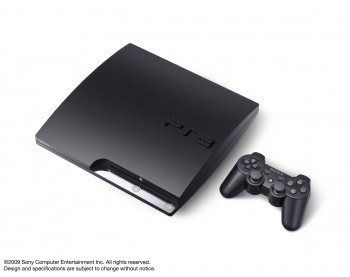 Finally, after months of shady snapshots from Chinese factories, info leaks from retailers and everyone just generally assuming it was going to happen, Sony has made it for real: there is a smaller, lighter version of the PlayStation 3 coming out...a PS3 Slim, if you will. The Slim will release on September 1 and be priced at $299, 299 Euros and 29,980 yen. It's supposedly 32% smaller, 32% lighter, eats up less power (yay for lower bills) and sports 120 GB of hard drive space. Otherwise, as Sony Europe's Jem Alexander says, the Slim has "all the same features your current PS3 has." Speaking of current PS3s, Sony will also be dropping the price tag on "all current PS3s on the shelf" to the same point as the Slim: $299 and 299 Euros. That price drop is effective immediately - retailers should have caught up by the end of the day. Most of them probably have already done so. Clearly, Kmart has. In North America, the 160 GB model bundled with Uncharted will drop to $399. So, all current models are cheaper and the Slim is coming soon. I don't see much reason not to just wait for the Slim if you want a PS3, unless you really hate its design, or really want another George Foreman Grill. I could understand that. UPDATE: Got some more specific info from Sony regarding the feature set of the machine. The Slim supports one new feature and loses one old one. The new thing is support for sync with Bravia TVs, where if you plug your Slim into a Bravia, you can manage the Xross Media Bar with your remote control, and turn off your system by turning off your TV. The thing it won't have that the old PS3s do is the support for other operating systems. "The new PS3 system will focus on delivering games and other entertainment content, and users will not be able to install other Operating Systems to the new PS3 system," Sony said.